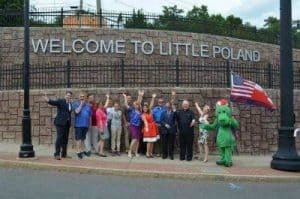 The following is a brief history of the city of New Britain, Connecticut where the Polish Genealogical Society of Connecticut and the Northeast, Inc. was founded and continues to operate today. New Britain was once the domain of the Tunxis Indians who hunted and fished here prior to European settlement. By the earlier part of the eighteenth century, New Britain had developed into a small, sleepy New England community quite like many of those which surrounded it. New Britain’s population was mainly Anglo-Saxon and Protestant. The Anglo-Saxon dominance and the homogeneity of the city’s population began to change in the 1840’s when large numbers of Catholic immigrants from Ireland arrived in the city. Several decades later, groups of Germans and Swedes provided further diversification of the city’s population. It was not until the 1880’s that the small trickle of immigrants from Eastern and Southern Europe began to be noticed. This trickle developed into a veritable flood as the century drew to a close, and by the outbreak of World War I, New Britain was home to immigrants from throughout Europe. Adding to this diverse and racial mix were French Canadians and people from the foreign Ottoman Empire. The foreign born and their children became the dominant demographic segment in the city’s population. By 1930 fully 80% of the city’s population was composed of immigrants and their children. New Britain was the site of the state’s largest concentration of Armenians, Swedes, Assyrians, and Poles. In the twentieth century, New Britain’s population was further diversified by migrants and immigrants from Latin American, the Caribbean and Asia, and Spanish speakers from Puerto Rico contributed the largest Spanish group. People from Mexico, Argentina, Peru and Colombia also made their way to the Hardware City. After the conclusion of the Vietnam War, the city witnessed an influx of refugees from Laos and Vietnam. Many of the Vietnamese refugees did not remain, moving to states with a warmer climate such as Texas and Louisiana. New Britain’s most recent new immigrant group consists of Arabic speakers from Yemen. Africa-Americans constituted approximately ten per cent of New Britain’s population for the bulk of the twentieth century. However, the largest of all of these groups was the Poles. 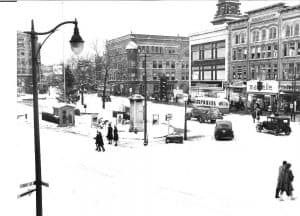 Attracted to the employment opportunities which the city afforded they, like many other immigrants, flocked to New Britain in great numbers to fill the need for laborers at the large industrial complexes that dominated the economics of the city as the twentieth century began. Industry has always played an important role in the city’s development. The city’s motto “Industria implet alveare et mele fruitur” (Industry fills the hives and draws the honey) underscores the importance of manufacturing to the city. Small foundries and other enterprises such as North and Judd, Stanley Works, Landers-Frary and Clark, Russell and Erwin and Corbin, etc. had moved from the small humble quarters where they began and prospered to the point where they were capable of constructing large brick factory buildings which dominated the city’s skyline. Mainly producing hardware, tools, buckles, appliances, cutlery and a myriad of metal products such as nails, screws, bolts and hinges, New Britain came to be known as the Hardware City of the World, second to none. In 1920 it was said that New Britain manufactured nearly one third of all the builder’s hardware in the United States and therefore justifiably was deserving of its sobriquet. In 1900, Poles were grouped in the area of the city surrounding the city center. The 1900 census listed 1,168 Polish-born residents of the city, a figure, when compared to figures from parish census materials was, much too low. In reality there were close to two thousand persons of Polish extraction in the city at the time. Most frequently they settled in close proximity to their places of employment. Panoramic view of the Broad Street area ca 1920 taken from Booth Street. The building to the right of Sacred Heart Church is the parish school. The area near Broad Street, which was to turn into the Polish “Main Street” in the beginning decades of the century, became the nucleus of the nascent community. Evidence of Polish settlement was noted early on streets such as High, Grove, Orange and Myrtle. The early settlers chose this area as home because it was very close to many of the city’s industries where they were first employed. Most of the city’s first Polish property owners purchased their first piece of American land here. In 1902 most of the land on Orange Street and parts of Grove and Myrtle Streets was owned by Polish immigrants. Some of the pioneer property owners included Bojnowski, Blogoslawski, Kirejczyk, Ostrowski, Brodzik, Laskowski, Rozanski, Tomaszewski, Kotowski, Wisk and Cieszynski. The neighborhood at the turn of the century had a rather rural appearance, unlike the dense urban setting of today. Many of the streets surrounding Broad Street did not exist in 1900; instead, vast stretches of meadows surrounded the early community. As the century wore on and the population became more economically stable, great expansion took place. Broad Street became dotted with commercial enterprises and three – and six-family homes. New streets north of Broad Street were forged such as Horace, Lyman, and Carmody. Headquarters and meetings rooms of the city’s numerous Polish organizations could also be found here. By the mid 1920s, Poles inhabited (and owned) most of the real estate in the city’s fifth ward, which encompassed the northwest section of the city. In essence, by the mid 1920’s the New Britain Poles had created a nearly complete replication of what many called the “urban village,” a self-sufficient city within a city where the needs of its residents could be served wholly within. By this time Polish doctors could treat your ills, a Polish mechanic could repair your car and you could shop in numerous Polish stores and markets. The closing years of the 19th century and first decades of the twentieth witnessed great population growth in the community. 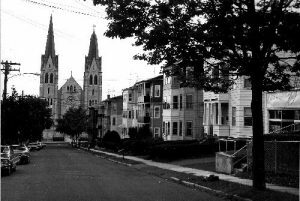 By 1910 there were 6,600 parishioners at Sacred Heart, New Britain’s first Polish parish, and by 1925 the number had grown to 9,500. Due to the continued growth of the community, a second point of settlement began to appear in the 1920s and 30s on Farmington Avenue and the neighborhood that was to surround New Britain’s second Polish Roman Catholic Parish, Holy Cross, prospered and expanded. Holy Cross parish, Connecticut’s last Polish ethnic Roman Catholic parish was established in 1927. In addition to the two large Roman Catholic parishes, Transfiguration of Our Lord Parish of the Polish National Catholic Church was formed in 1943 and a Polish Baptist congregation has been active in the city since the 1960s. Today, the community is somewhat changed both physically and demographically from what it was in the earlier part of the century. In the last two decades of the 20th century some of the housing stock in the Broad Street area has been razed. A good number of the factories that provided a livelihood for the early immigrants are long gone as well, due to urban renewal and highway construction projects. Still, the Polish population of the area is sizable, but numerically declining. However, Polish owned businesses established by recent immigrants thrive. Poland’s territories at the end of the eighteenth century were divided between its powerful neighbors, Russia, Austria and Germany in a series of land seizures commonly referred to as partitions. Fleeing poor economic conditions and the practices of the partitioning powers that sought to eliminate traces of the Polish language and culture, many Poles left the country, beginning in the late 1870’s. One of these immigrants was a certain Tomasz Ostrowski, who is credited with being New Britain’s first Polish settler. Ostrowski, like many of those who were to follow him, came from the part of Poland under the control of Imperial Russia. Nearly two thirds of the immigrants from Poland who arrived in New Britain before 1914 were from Russian Poland, with most of the remainder from the Austrian partition (Galicia). 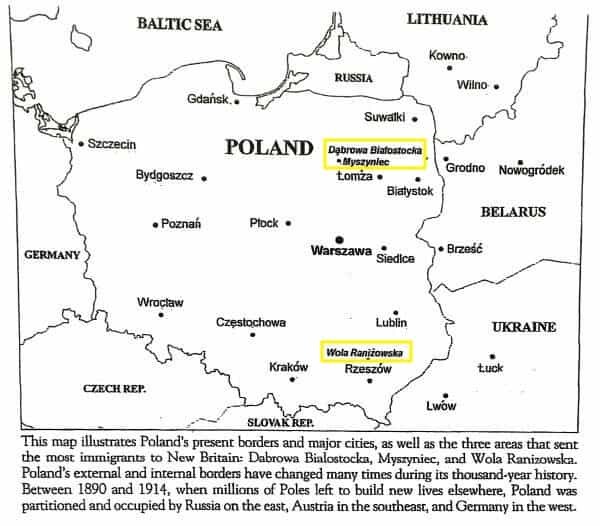 Poles from the German partition constituted a very small percentage of the Polish population, as elsewhere in New England. New Britain’s Polish settlers came principally from the provinces of Grodno, Łomża and Płock, with smaller but significant numbers from certain parishes in Galicia as well as from the Russian controlled province of Suwałki. The parishes of Dąbrowa Białostocka in Grodno Province and Myszyniec in Łomża Province sent the greatest number of settlers to the city. The Galician village of Wola Raniżowska and its immediate area was as well a great provider of human labor for New Britain’s factories. Early records also show a migration into New Britain by Polish immigrants and their American born children from other Polish-American settlements, notably from the coal mining areas of Luzerne, Lackawanna and Schuylkill Counties in Northeast Pennsylvania and especially from towns such as Shenandoah, Nanticoke and Dickson City. Others migrated into the city from various locations in nearby Massachusetts such as Three Rivers, Thorndike, South Deerfield, Northampton and Turners Falls. There was also noted migration to New Britain from Brooklyn NY and several locations on Long Island as well as smaller numbers from various Polish settlements in Maine, Rhode Island, Vermont, New Hampshire, New Jersey, Michigan, Ohio and several other states. The old Sacred Heart School built in 1910 and located on Gold Street was a state of the art educational facility for its time. The primary goal of many of the immigrants of the late nineteenth century was the formation of a Parish church so that the cultural and religious traditions brought with them from Poland could be continued in the New World. The parish church in rural Poland was the focal point of the people’s existence and both their spiritual life and social life revolved around the church and its feast days and holy days. In partitioned Poland in the nineteenth century, the church was frequently the only area of public life not tainted by the oppression of the occupying powers. Therefore it is not surprising that the first Polish settlers set about the task of establishing their own parish and simultaneously reestablishing the social patterns and customs they had known in Europe. The establishment of a parish church was most often preceded by the formation of a society or organization, which would collect money toward this goal. Thus on September 29, 1889, the Mutual Benefit Society of St. Michael the Archangel was created, whose purpose was not only to work toward the establishment of a parish church but, as its title implies, to provide aid and sustenance to those members of the small community who needed it. Before the creation of Social Security and widespread government programs, such groups were common and necessary among all immigrant groups. The community’s efforts met with success as on November 14, 1894 official documents were submitted to the Bishop of Hartford; petitions for the founding the Roman Catholic Parish of St. Casimir the Prince. In 1896, a wooden structure was erected on Orange Street, which served as the young parish’s church and school. Now called Sacred Heart Church (the name was changed in the interim) this modest wooden building was replaced by the present magnificent white sand marble Gothic structure on Broad Street. The construction of the second church lasted from 1902 to 1904. The interior had a seating capacity of 1,500 and featured five altars was built of blue stone. The parish’s first pastor was the Rev. Tomasz Misicki. He was replaced in September of 1895 by the Rt. Rev. Lucjan Bojnowski, who administered to both the religious and material needs of the city’s large Polish immigrant population until his death in July of 1960. Lucjan Bojnowski was one of New Britain’s most famous Polish citizens. Born in Swierzbutowo, parish of Dąbrowa Białostocka, Province of Grodno in 1868, he came to the United States in 1888 and shortly after enrolled in the Polish seminary at Orchard Lake, Michigan. After being ordained, he was assigned to a Slovak parish in Bridgeport where he served for approximately six months. His arrival in New Britain in 1895 marked the beginning of the Bojnowski era in the history of the Polish community. Bojnowski’s accomplishments were substantial. His efforts to provide a structure that would care for his parishioners from the cradle to the grave occupied the great majority of his time. 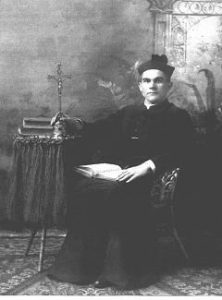 He established various religious societies at the parish, the first being the Towarzystwo Panień Dzieci Marji pod Opieką Niepokalanego Poczęcia on February 14, 1897. The Towarzystwo Imienia Jezusa was created July 11 of the same year and several days later the Towarzystwo Sióstr Różancowych was founded on July 15. The Knights of Boleslaus the Brave Society was founded in 1895. Two other early organizations were of a political nature. Both were established in October of 1900 and were evidence of a rift in New Britain’s fledgling Polish organizational network. One, the Polish Political Club #1, did not enjoy the backing of Msgr. Bojnowski. The other, which he endorsed, was the Polish Citizens Club. In 1904 Bojnowski founded an order of nuns, the Daughters of Mary of the Immaculate Conception. He also founded a Polish Orphanage, Our Lady of Różanystok, whose name derives from a much-revered icon in his native parish. In 1906, he established a Polish language newspaper Przewodnik Katolicki which ceased publication in the late 1960s. Bojnowski was also instrumental in the creation of a Polish bank, Peoples Savings Bank, in 1907. Sacred Heart Cemetery, located in the corner of Burritt Street and Osgood Avenue, was established in 1912. It is the largest Polish cemetery in New England. His last major project was the erection of St Lucian’s Home for the Aged, which was constructed in 1925. As the first decades of the twentieth century progressed, new organizations arose. A number of additional church societies and branches of national fraternal organizations were formed. These included several chapters of the Polish Roman Catholic Union, a fraternal insurance organization headquartered in Chicago. These chapters included St. Agnes Society, founded in 1912; St. Lucian’s Society founded in 1907, and St. Rose of Lima Society, founded in 1929, St Aloysius Society , St. Agnes Society and Holy Family Society founded in 1928. Sts. Peter and Paul Mutual Benefit Society arrived on the scene in 1912. Three lodges of the Polish National Alliance also were established in the city, the first, Group # 478 was founded in 1899. Others included Lodge # 2093 founded in 1919 and #2612 established in 1930. Aside from the Polish Political Club #1 mentioned above, other political organizations were also organized as the Poles sought to convert their numerical dominance in the city’s population into political power. The Pulaski Democratic Club was founded in 1931, along with its women’s auxiliary. Polish Republicans founded the Polish American Republican Club in the 1920s whose name was later changed to the Oaks Club, named after two large oak trees located on the property of the reorganized club’s founder Joseph Kowalczyk. The political clubs conducted citizenship classes for immigrants and supported and sponsored candidates for local, state and national political office. Henry Gwiazda was New Britain’s first Polish American mayor, elected in 1946. Before the century drew to a close, New Britain would have five additional mayors partially or totally of Polish descent. These included Democrats Julius Kremski, Stanley Pac, William McNamara and Lucian Pawlak. Republican Linda Blogoslawski, the city’s first woman mayor, was elected in 1993. The current mayor, Erin Stewart, partially traces her ancestry to the parish Dąbrowa Białostocka. A nest of the Polish Falcons was formed in 1907. The Falcons were initially sports oriented organization but during the World War I era assumed the role of schooling and training of troops to fight for the independence of Poland. New Britain was in fact one of the many recruiting venues nationwide for Haller’s Army, composed of Polish immigrants trained in the US and Canada who fought under French command in Europe. Julian Klejbuk and immigrant from Grodno Province was New Britain’s first volunteer of 300 who went to war to fight the Kaiser and restore the independence of their native country. Nearly 700 New Britain Poles joined the US Armed forces as well. The Komitet Obywatelski, formed before the war, collected funds for Polish independence and actively supported the war effort, amassing an imposing 870,000 dollars for various uses such as an invalids fund for soldiers. Returning veterans formed a local branch of the Association of Polish Army Veterans Association in 1920 (General Jozef Haller Post # 111). 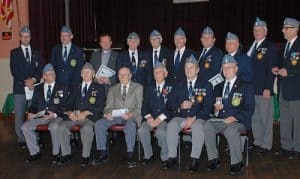 After World War II Polish-American veterans of the US Armed forces established the Sakowicz Post of the Polish Legion of American Veterans, named after a Polish immigrant from New Britain, Sgt. Józef Sakowicz, US Army, who gave his life at the battle of Seicheprey in April of 1918. Various other clubs and organizations were active in Polonia. In ca. 1912 Polish merchants and professional people established the Polish American Businessmen’s Association. The owners of numerous Polish owned grocery stores which dotted the city formed a Polish-American Grocers Association. Groups of other national or regional fraternals were also active in the city including the Polish National Alliance of Brooklyn, The Polish Women’s Alliance, and The Association of Polish Mechanics. The 44 Club, begun in 1939, was an organization of Polish university graduates and professionals. Cultural and recreational activities were plentiful in New Britain’s Polonia as well. The parishes, long bastions of cultural maintenance, were an avenue to maintain the rich traditions of the homeland. Christmas and Easter customs are still very much alive today as well as the traditional Polish style ceremonies to honor the dead on All Souls Day. A theater group was formed in 1925 (Kółko Teatralne Sw. Elżbiety). A Polish Literary Society and Book Club was also active in the city. Parish choir and singing groups were also very active, such as St Cecelia’s Choir of Holy Cross Parish and the Polonia Paderewski Choir founded in 1957. Athletics were popular among Polonia’s youth. Local teams participated in the State Polish Basketball League and many of the members of sports teams of local industries and athletic clubs were of Polish origin. Falcons’ baseball and gymnastics teams from New Britain over the decades emerged victorious as state and local champions. Several of the Falcon’s National Meets were held in New Britain during the course of the 20th century as well. More recent immigrants are active in Polish soccer teams and clubs dedicated to skiing and hunting. Dozynki, a centuries old tradition of celebrating a bountiful harvest was and is still celebrated in New Britain. The arrival of numerous Displaced Persons (DPs), refugees fleeing Europe in the aftermath of World War II, as well as continued immigration from Poland throughout the post war period have rejuvenated some of the older clubs and organizations. More recent organizations established by the newer waves of immigrants include the Polish Saturday School (1960), which provides instruction in the Polish language, history and culture to the children of the community. Part of a national network of such schools, New Britain’s is the largest on the East Coast. Troops of Polish Boy and Girl Scouts were founded in New Britain in the late 1950s and still thrive. Other activities of the “new” Polonia include the four Polish language newspapers, Przegląd Polonijny z Connecticut, Biały Orzeł, Malopolska and Polski Express, as well as Polish language public access television programming, radio programs and an abundance of Polish owned businesses in the old neighborhood. In recent years, the neighborhood has undergone a major “face lift” with new sidewalks, road improvements and street lights. Because of its unique nature, the neighborhood has been officially designated as “Little Poland” and attracts visitors from throughout the region. The wrought iron gates which mark the Burritt Street entrance to Sacred Heart Cemetery are long gone. Over 10,000 members of the community rest in this, the largest Polish cemetery in New England. New Britain’s Polish community also has two Polish cemeteries. Sacred Heart (Roman Catholic) was founded in 1912 – it is the largest Polish cemetery in New England. Transfiguration Polish National Catholic Cemetery was blessed in 1941. Two parochial schools, Sacred Heart (est. 1896) and Holy Cross (est. 1955) served the children of the two parishes. Initially classes at Sacred Heart were held in the old church. In 1910 a four story brick school was built on Gold street which was state of the art for its time. It included 16 classrooms, a library, an assembly hall for school and parish activities plus two swimming pools and bathing facilities, the first in the city for women. The old school building was razed in the early 1970s. A second school was built in 1927 on Orange Street and continues to function as the parish school today. In the early 1920s, enrollment at the school topped 2,000. Holy Cross School opened it doors in 1954 with 279 students. The school, located on Farmington Avenue and Eddy Glover Boulevard, merged with several other Catholic schools in 2006 and is now called Pope John II School. After its closure, the school currently temporarily houses a public school. Among the newer organizations is our own. Polish-Americans interested in the history of their families’ past and their ethnic origins founded the Polish Genealogical Society of Connecticut in 1984, along with its Archive and Resource Center which collects materials on the history of the community and its individual families. Today’s Polonia is not the same as that of our grandparents who came to New Britain seeking a better life over a century ago. The ties, which bound the traditional old neighborhood together, have somewhat unraveled, but the community has adapted and changed. We are strong. We will survive.